The British Ironwork Centre near Oswestry is celebrating after reaching the milestone of 100,000 members. "We couldn’t have reached this amazing figure without everyone's help and support throughout the years," the team said. "With so many people bringing their friends and families, spreading the word out further afield, and taking the time to leave us positive reviews and feedback, you have helped us tremendously in achieving this massive number and we are extremely grateful. "100,000 members means a lot for us, but it also means a lot for the whole county of Shropshire and its bordering areas. With so many members coming through Shropshire to visit us, our county tourism can reach new, and very well deserved, heights. "We have members visiting us from all across the UK and beyond. Often these visitors will stay within the Shropshire and Oswestry areas to explore other parts of our incredibly diverse county, driving tourism far beyond just our centre. 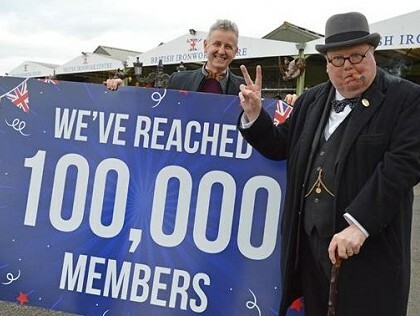 To celebrate the achievement, the centre even had Sir Winston Churchill himself join . . . in the shape of lookalike Stan Streather.